A brand new muffin tray, a decent loaf tin, a bonnie pizza dish, and a comely bundt/tart springform.... wooooh, I feel I'm a billionaire today, in fact better than one. I have been starving for these baking weapons for a long time, and now the wait is so sunnily over. I remember the first time I had muffins, and I definitely being a student not interested in strange things like cooking (hehe...my mom used to say that your hubby will always repent on choosing a girl like you who doesn't know cooking... :P), never thought that one day I would bake these by myself. Cakes are almost on fingers these days, but this unending wait for a muffin mold had been killing me for a while, and as soon as it landed in my kitchen, I had to be sure that I do justice to it right then. Since I could not manage to find a desirable muffin tray, I finally fell over this 'Mini Muffin Tray'. The outcome was cute, really cute. 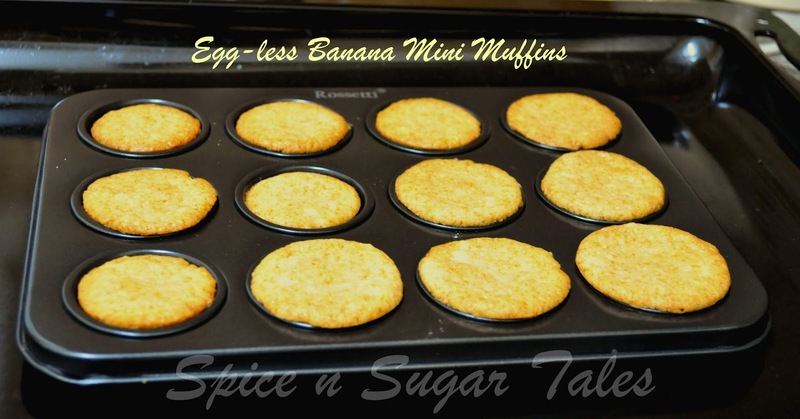 For this first attempt, I wanted to go egg-less, and then had some bananas screaming at me to get used, so ended up making these Egg-less Banana Mini Muffins'. 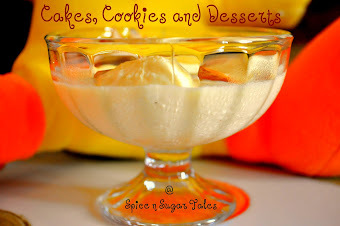 I had no vanilla essence, so thought of keeping it natural and added some cardamom powder for the real flavor and aroma. My muffin baskets/liners were not fitting into these mini molds, so I had to grease the tray and use directly, but the tiny-miny cuppy cakes popped out easily because of the non-stick coating, and they reminded me so much of the "meetha pakoda/gulgule' aka 'mandazi (as called in Kenya) with the only exception being the maida instead of aata, and then this baking rather than deep frying. They were soft, really soft, and equally spongy, too. Though they did not puff much on the top, but they tasted wow!! My 18 months old doll grabbed 2 of them and they were down her throat in 5 minutes, which was a proof that they were really good (she's too finicky about taste and food stuffs). The next time I'll be baking them with whole wheat flour and jaggery, to exterminate the 'refined' concept. Pre-heat the oven at 180 degrees for 10 minutes and line/grease the muffin tray. Take butter (at room temperature) in a bowl and beat it with sugar till it becomes soft and fluffy. Pour in the yogurt and beat well. Add in the pulsed banana/banana pulp and cardamom powder/ essence; give a stir. Sieve the flour, baking powder, soda and salt thrice. Fold in this dry mixture to the wet ingredients and fold gently. Add milk gradually and mix. 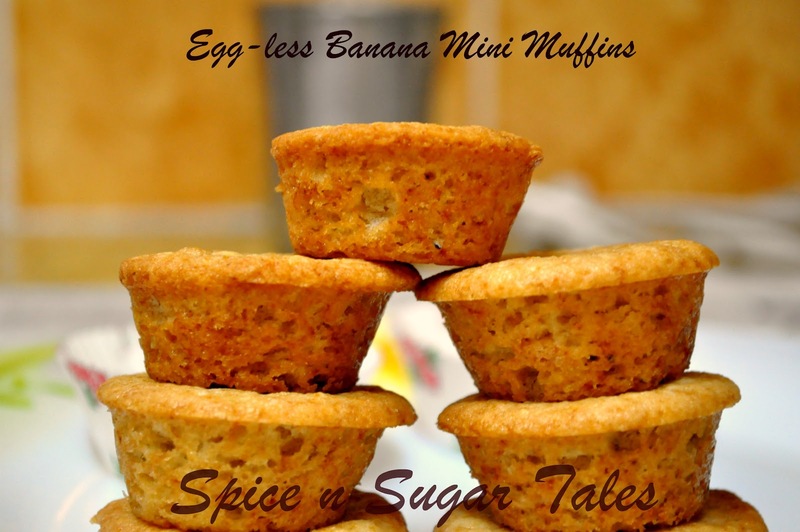 Avoid over-mixing or the muffins will turn up hard. The mixture should have a ribbon consistency, and it should look aerated and fluffy. Spoon it in the muffin pits keeping them 2/3 full. Do not over-fill, since they will puff up on baking, and the batter will pour out. Bake for 10-15 minutes depending on your oven (mine took 14 minutes exact) till a tooth-pick inserted comes out clean. Also they'll look done when their top goes light golden and the sides brownish golden. Transfer the tray on a wire rack and let it cool for 5 minutes. Amazingly, you need not use any knife to scrape the edges of the muffins; they will easily pop out when you hold them up slightly. 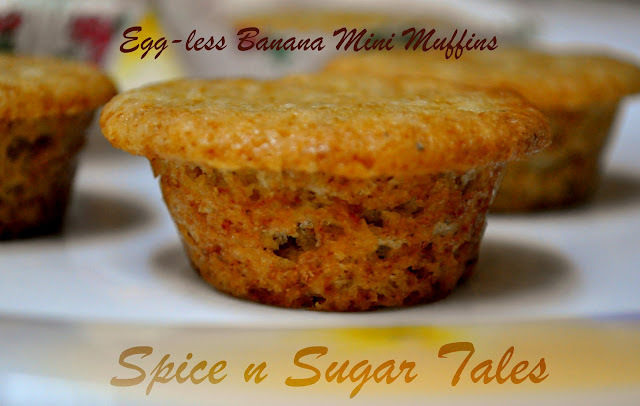 In place of banana, you may add any fruit pulp or keep it simple without any fruits. Baking soda and baking powder can be replaced with 1/2 tsp Eno Fruit Salt. 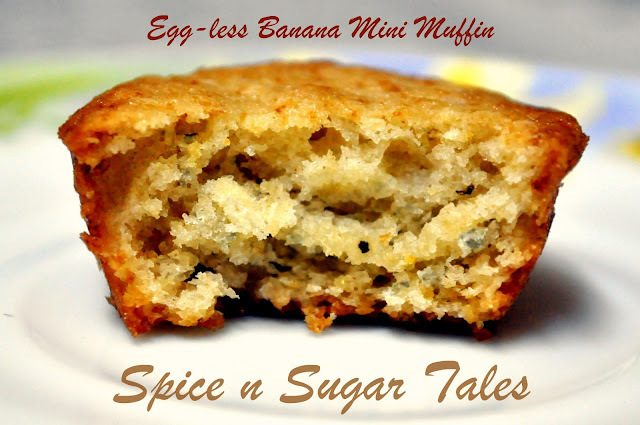 These muffins will not have a highly puffed up top due to the absence of eggs, but the sponge will still be there. You can top them with jam, cream or chocolate if you don't like them plain. Don't over-mix the batter; don't over-bake either. I envy you Anjali. All those bake wares. I think I will feel rich too. I'm yet to get a decent bundt pan here. And to the muffins they look so cutey. lovely texture too. Amazing nets u have got in that cake. 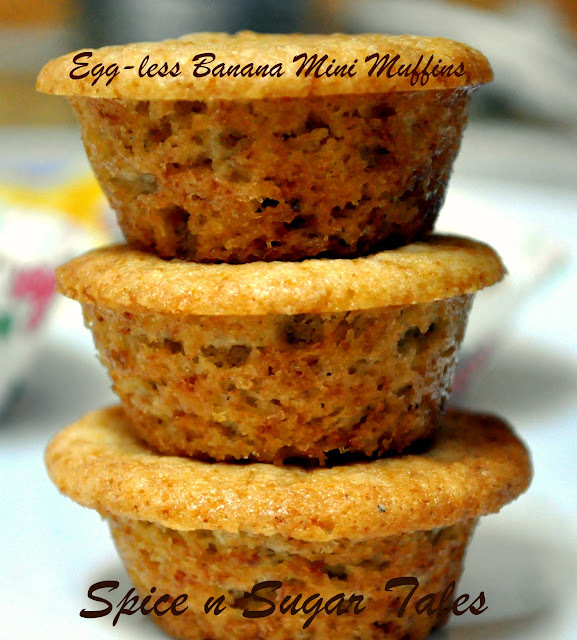 Mini muffins are so cool and can be made into pops also so easily. They hold themselves swell and look very cute too. muffin looks so cute. Love the edges of the muffin. they look super cute.. i made them to & was wodnering why they didn't puff up!! Looking for all lovely wonders u are going to come up with !! Cute muffins !! looks so soft and perfectly baked !! They look very good and I like the name you have given..
soft and super delicious muffins. lovely presentation as well. Yumm!! You seem to be on a baking spree. The Mini muffins look so cute no wonder your little angel loved it. 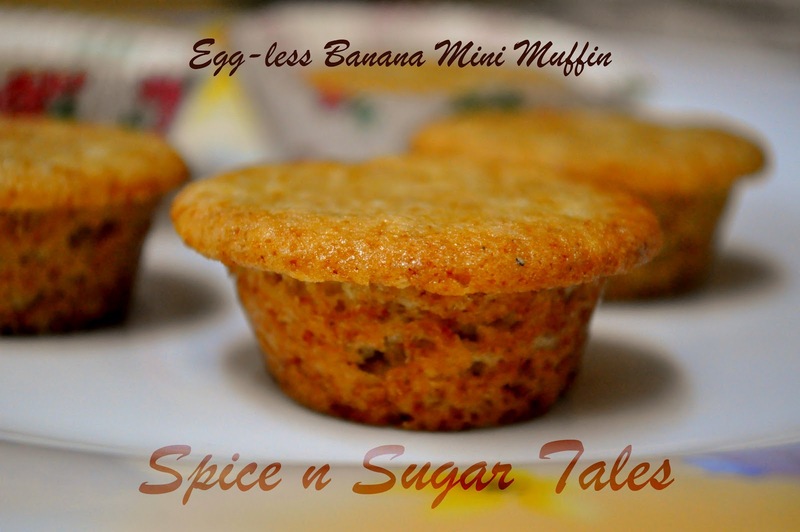 Yummy muffins... 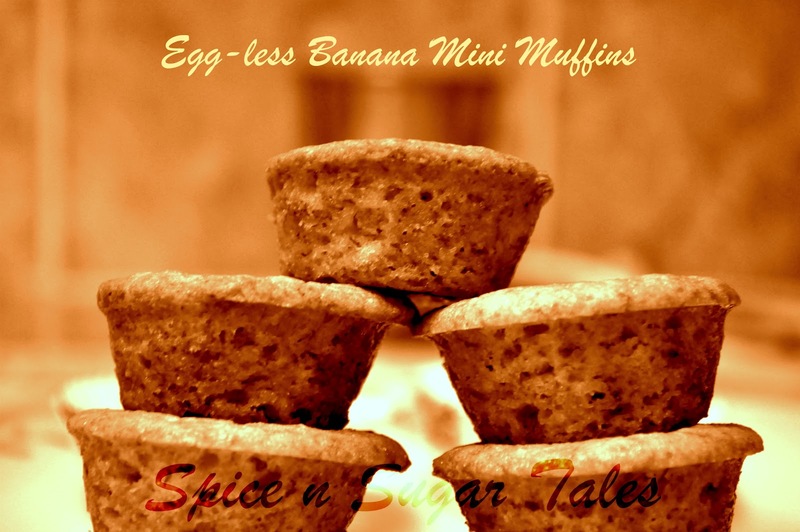 They are delicious..
wow this looks awesome,I like the photography too!!! Happy to follow you!!!! do stop by mine!!!! totally drooling here :) thanks for linking Anjali ! These are too cute! 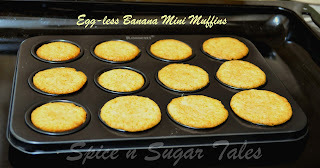 I have made a couple eggless recipes, I may just try this one out too! That looks perfect! A great grab and go breakfast:-)Thank u for visiting my space and leaving such lovely words..Glad to follow u and stay tuned to more yummy recipes! Muffins look so soft, wonderful! Congratulations dear on getting your new baking treasures! Enjoy!! !